Keep your nails looking fabulous at all times with this Compact Manicure Case. 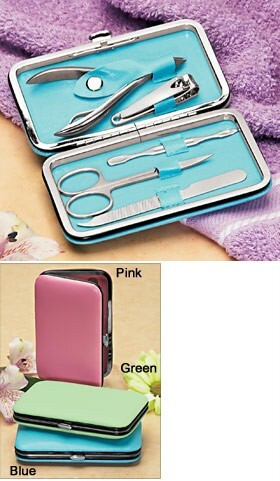 Slim, stylish case includes all the tools you need to keep your nails healthy. Designed with the look and feel of leather, the hard-sided case (4-3/4" x 3" x 1/2") opens easily with the press of a button and has a snap closure. Available in Blue, Pink and Green. Be sure to pick up several Compact Manicure Cases to give as thoughtful gifts!